As is always the case at these major turning points, the usual analysts are going to get it wrong again. The dollar is finishing an intermediate cycle decline, not starting one. Stocks are dropping down into a half cycle low of intermediate degree, not starting another leg down in a bear market. And gold is putting in an intermediate degree top and will drop down into a yearly cycle low, it’s not starting a sustained move higher. Seriously how do these guys manage to get it wrong at every one of these turning points? This entry was posted in Uncategorized on April 30, 2016 by Gary. Regression to the mean. There is one universal law in this business and it never never gets broken. Price always regresses to the mean. This one is like death and taxes. It is never violated. And the further price stretches in one direction the harder it moves back once the trend comes to an end. Folks, we are in the panic chasing stage now. But let me caution again that there is no scenario where price can stay this stretched above the mean for any significant amount of time. Try to ignore this nonsense that intermediate cycle lows can occur as sideways consolidations measured only by time, and not include a correction in price. 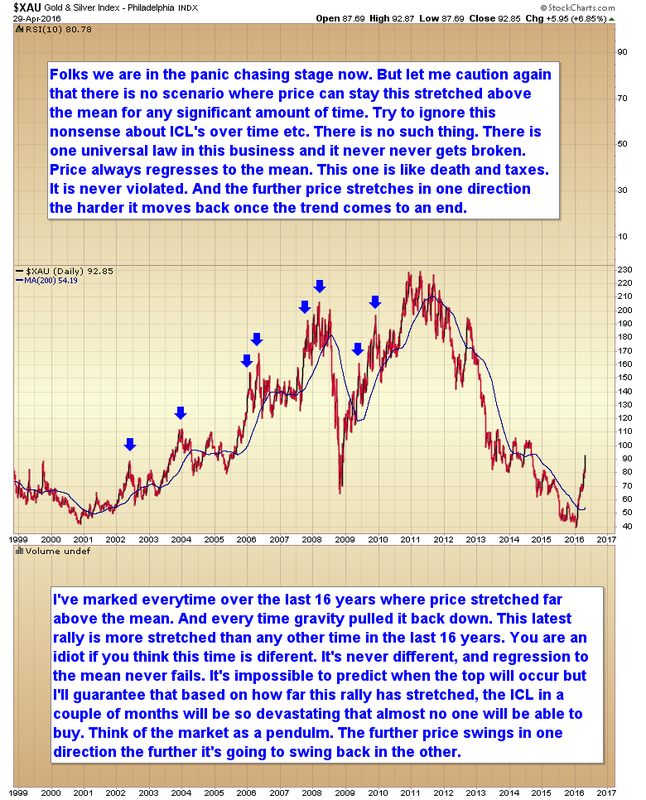 I’ve marked every time over the last 16 years where price stretched far above the mean. And every time gravity pulled it back down. This latest rally is more stretched than any other time in the last 16 years. You are an idiot if you think this time is different. It’s never different, and regression to the mean never fails. It’s impossible to predict when the top will occur but I’ll guarantee that based on how far this rally has stretched, the intermediate cycle low (ICL) in a couple of months will be so devastating that almost no one will be able to buy. Think of the market as a pendulum. The further price swings in one direction the further it’s going to swing back in the other. This entry was posted in Uncategorized on April 29, 2016 by Gary. Gold is in the final phase of the baby bull rally. This is the stage that causes maximum pain for shorts that were unable to recognize that the bear market is over, or tried to sell short (I warned and warned traders not to short a baby bull). This is also the stage that causes maximum anxiety for longs who aren’t in the market. This is the time when the bull tries to get as many traders as possible to panic in at the top so as to catch them in the first reaction. This entry was posted in Uncategorized on April 28, 2016 by Gary. COULD STOCKS FINALLY DECLINE INTO AN OVERDUE CYCLE LOW? With the bank of Japan leaving monetary policy unchanged, the global markets are selling off this morning. This may be the chance for the stock market to move down into a clear & recognizable daily cycle low, clear the overbought conditions, and reset sentiment before a drive higher to retest the all-time highs. Miners are extremely overbought. The longer something rallies the more confident retail traders become and the more likely they are to chase price – afraid they are missing the move. A professional trader thinks exactly the opposite. The longer something rallies the closer it is to a correction, and the more nervous a professional becomes. At the recent top GDX was stretched 51% above the 200 day moving average. That is the definition of dangerously overbought. This is not the time to chase. Wait for the Intermediate Cycle Low (ICL) in June. This entry was posted in Uncategorized on April 27, 2016 by Gary. Biotech may be stuck in a trading range and not ready to breakout and trend yet. This entry was posted in Uncategorized on April 26, 2016 by Gary. I cover the stock market, oil, gold and the currencies in my interview this morning with Jim Goddard. 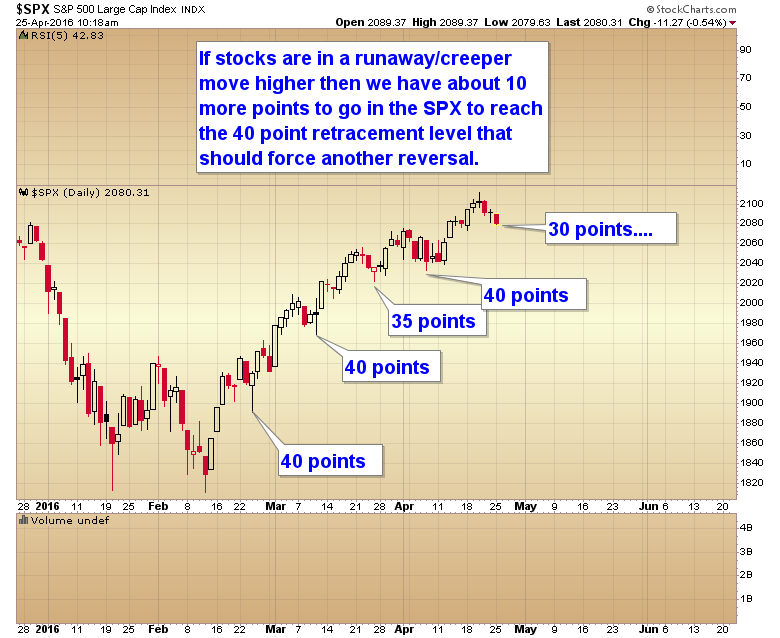 If stocks are in a runaway/creeper move higher then we have about 10 more points to go in the SPX to reach the 40 point retracement level that should force another reversal. This entry was posted in Uncategorized on April 25, 2016 by Gary. Euro top? Maybe. The odds are starting to favor a top in the euro and bottom in the dollar. Patience with gold is required. 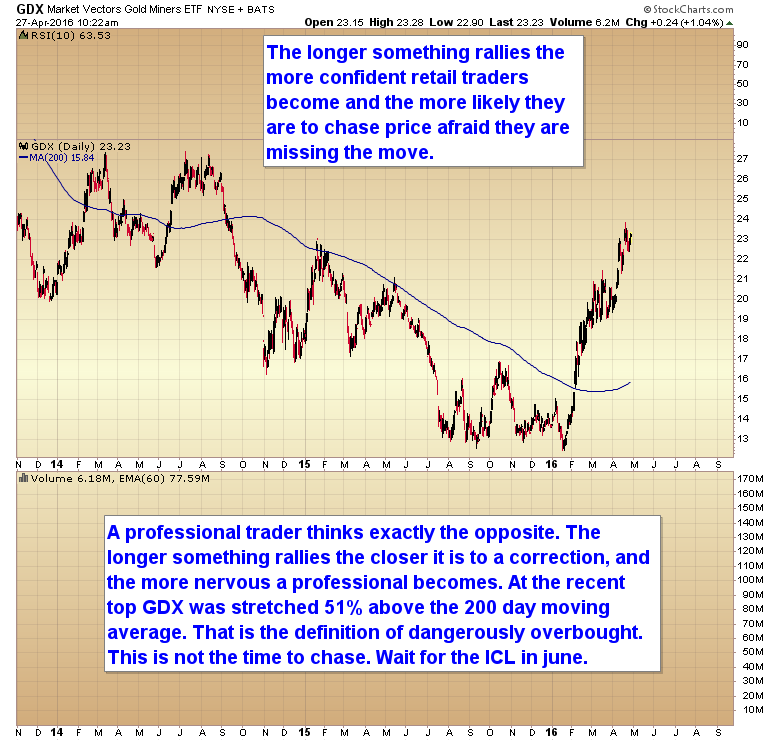 I don’t anticipate the next good buying opportunity in the precious metals sector until probably June. This entry was posted in Uncategorized on April 24, 2016 by Gary. Stocks are starting to exhibit all the characteristics of a runaway move. Shorting is not a viable strategy during one of these type rallies. This entry was posted in Uncategorized on April 22, 2016 by Gary.